The United Nations Education, Scientific, and Cultural Organization on Tuesday passed a resolution demanding that Israel disavow Jerusalem as its capital. The resolution, which UNESCO brought up for a vote on Israel's Independence Day, was backed by the Palestinian Authority and calls on the Jewish state to reject any sovereignty in the city of Jerusalem. "All legislative and administrative measures and actions taken by Israel, the occupying power, which have altered or purport to alter the character and status of the Holy City of Jerusalem, and in particular the ‘basic law' on Jerusalem, are null and must be rescinded forthwith," the resolution stated. Algeria, Egypt, Lebanon, Morocco, Oman, Qatar, and Sudan submitted the resolution to the 58-member body's executive board. The vote passed with 22 countries in the resolution's favor, 10 opposed, and 23 abstentions. Representatives from three countries were not present. The United States led the group of nations that voted against the resolution, which also included the United Kingdom, Italy, the Netherlands, Lithuania, Greece, Paraguay, Ukraine, Togo, and Germany. Israeli Prime Minister Benjamin Netanyahu decried the resolution as "absurd" but said the vote is a sign that more countries are being supportive of the Jewish state in international forums, according to the Times of Israel. "Today there are more countries abstaining or supporting Israel than countries against Israel," Netanyahu said. "That is a change, for the first time." Israel's ambassador to UNESCO, Carmel Shama-Hacohen, was draped in an Israeli flag as he condemned the resolution's passage. "Even now, after this miserable vote, this blue and white flag is flying high above the Temple Mount and throughout Israel's eternal capital city, Jerusalem, waving in the wind, saying to all, ‘Here we are, and we are here to stay,'" Shama-Hacohen said. Florida Rep. Ted Deutch, the top Democrat on the House Foreign Affairs Subcommittee on the Middle East and North Africa, castigated UNESCO for Tuesday's vote. "Once again UNESCO member states tried to deny the historical connection of the Jewish people to Israel," he told the Washington Examiner. "Referring to Israel as ‘occupiers' of Jerusalem lacking any legal or historical rights to the holy city ignores the millennia-old connection of Jews to the land … To take this vote on Israel's Independence Day is a particularly new low." UNESCO and the U.N. as a whole have a lengthy history of anti-Israel activities. 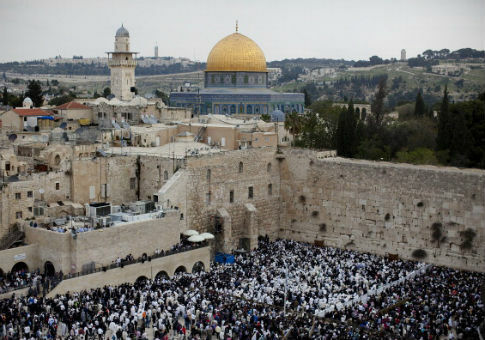 In October, the U.N.'s cultural body passed a resolution diminishing the historic and spiritual connections of Judaism and Christianity to the city of Jerusalem. The document contained a provision for the Temple Mount, the holiest site in Judaism, to be sacred to "Muslims only." This entry was posted in Issues and tagged Anti-Semitism, Israel, Jerusalem, UNESCO, United Nations. Bookmark the permalink.